Since 1901 and the launch of its single-cylinder van, Renault has been a major player in the light commercial vehicle range. It has been the LCV market leader in Western Europe for the past 12 years, and even increased its market share this year, from 14.4 per cent to 15.7 per cent. This increase was driven primarily by the launch of three new models at the start of the year: New Master, Trafic and Kangoo van. Renault’s LCV range now spans load volumes of between 2 and 22 m3, in order to meet all the needs of business customers. 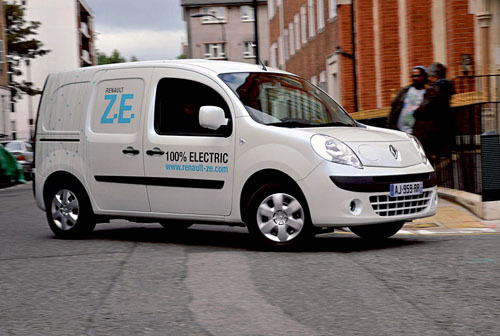 At the International Commercial Vehicle Show in Germany last week, Renault premiered the production version of Kangoo Van ZE (zero emission ), the first all-electric van developed and built by a vehicle manufacturer. Renault says the Kangoo Van ZE will be sold in Europe for €20,000 excluding VAT and any national tax incentives. Renault has developed several innovative purchasing concepts for its electric vehicle. Ownership of the vehicle will be separate to that of the battery. Customers will be able to purchase or rent their ZE van and take out a subscription for the battery. In the UK, this will cost from £59 excluding VAT per month, based on four years, 9,000 miles per year. Prices and details of the model range and their date of availability in Ireland will be announced in mid-October. The pre-order book will also be opened.